It’s been quite a long time since a Lamy mechanical pencil featured on this blog, so it’s time to put things right. Here then we have the Lamy Logo model 105 black mechanical pencil. 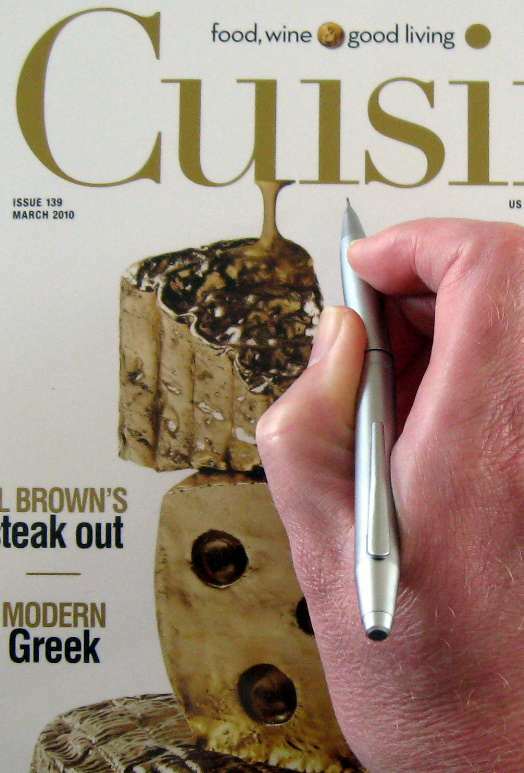 The Logo is part of what Lamy call their Modern Office range, as opposed to their High Quality Writing or Young Writing ranges. Modern Office…well the Logo does have a relatively modern looking style about it. Stainless steel and black plastic body, square end to the body and pocket clip mount. Overall then it’s a fairly plain simple look, but with a stylish silhouette. Like most Lamy writing instruments the Logo comes in other system options – BP, FP and multi-pen. The 105 option has a stainless steel body with a slightly brushed finish, but is mirror polished on the clip. The plastic accents are black on mine, but there are other colour options. There is also the Model 106 which is brushed stainless steel, and the Model 104 which is a black resin body. Weighing in at about 13 grams, the 105 is definitely not in the heavyweight class, despite its steel body and reasonably substantial dimensions. The grip zone is formed by a series of rounded rings pressed into the steel which feel quite nice under-finger and work very well at keeping your grip firm. There are also some ridges on the upper part of the plastic tip for those who like to grip their pencil really close to the tip. They also of course continue the ridged aesthetic look. 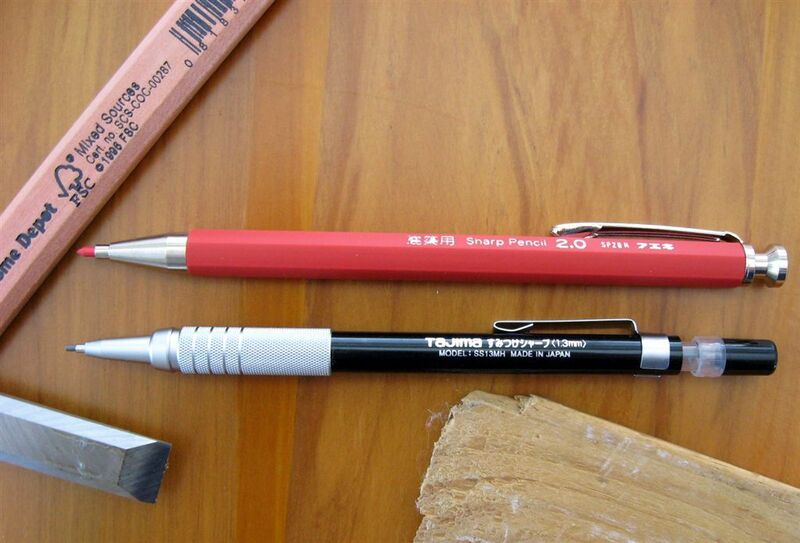 The Logo mechanical pencil is only available in 0.5mm lead size. The lead sleeve is a 2mm long thin pipe, not long enough for drafting work. It is retractable for pocket safety. Now this is the bit that a small number of you are not going to want to hear. Wobble. Yes, lead wobble. It’s not bad and didn’t really worry me, but there is definitely some wobble between the small black plastic front cone and the black plastic front section. Then there is also some wobble between the lead sleeve and the black plastic front cone that it is inserted into. Some of this is possibly due to lead cushioning, and for general writing it’s of little to no concern, but it’s there and some of you ask about lead wobble. There is a lot of cushioning in the tip, you can feel the lead springing back if you press hard onto the paper. It’s also a fairly noisy pencil. There is rattle of the internals, and the spring motion of the lead cushioning also sometimes produces some springy sounds. I didn’t actually mind the aural experience, but some might. As you would expect, it is a standard push top ratchet mechanism pencil. Ten clicks will get you about 9mm of lead. The pencil though has two somewhat unusual features for a push top ratchet pencil. Firstly, there is no eraser under the push top button, or anywhere else for that matter. Secondly, you don’t refill the lead magazine by removing the push top button. Instead, you unscrew the plastic front section from the body, pull the innards out, and then you can pull the little cap off the refill magazine and stick a couple of pieces of lead in. Note the lead jam clearing needle on the refill magazine cap. As is so often the case with my Lamy’s, no instructions were included in the box. With a bit of effort you can find instructions on the Lamy website, but it would be better if they were included with your purchase. The pocket clip is spring loaded and very functional. It slides onto anything with ease, yet has the strength to keep the pencil clipped on. As is usual for Lamy, their logo and branding is minimal and muted. 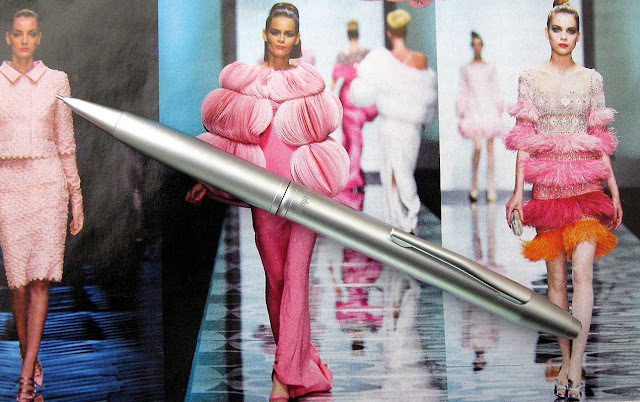 “Lamy” printed at the top of the body by the pocket clip is the only marking on the pencil. There is no indication of country (incorrect - see reader comments), model name or lead size. A nice pencil, as always, from Lamy. • Best Points – Good looks, good pocket clip. 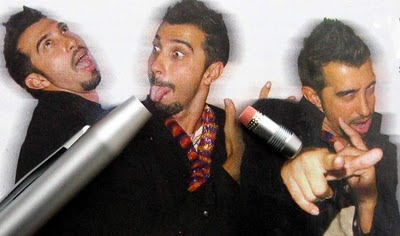 • Not So Good Points – No eraser, noise? • Price Range – Low/Mid. Dimensions – Length 137mm, diameter 10mm. Balance point about 80mm up from the tip. This Lamy Logo 105 mechanical pencil was provided to me by Cult Pens. Thanks Cult Pens. The oldest known pencil in existence is a carpenters pencil dating from the 17th Century. Time moves on. 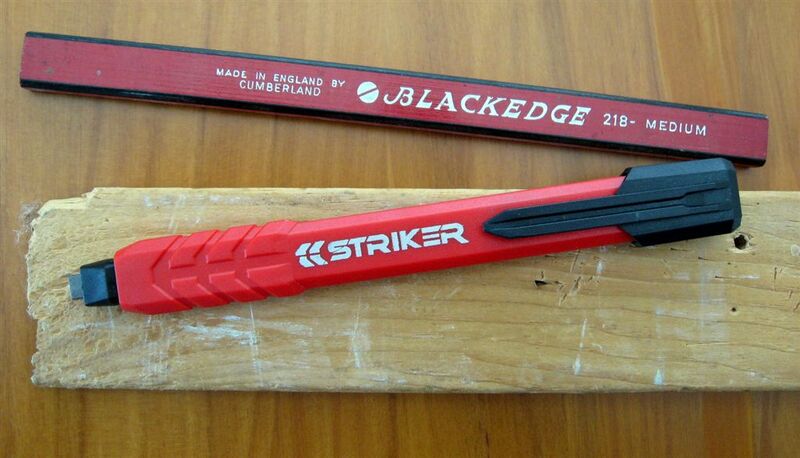 Part of the Biss Products design brand group, “Striker” is the brand name used for their range of hand tools, which includes a mechanical carpenter pencil. Or should that be carpenters mechanical pencil, or mechanical pencil for carpenters or…? Striker claims their carpenters mechanical pencil is tough, durable and reliable, and you can run it over with a ¾ ton truck and it will still keep working. I’m not a carpenter, which makes me the black sheep of the family. I suppose I should really be a collector of carpenters pencils…but I’m not? However growing up around all that sawing and hammering, helping build many relatives’ houses, etc means I do know my tenon saw from my fret saw, and I just don’t see my sawdusty relatives using a Striker. I don’t see it being suitable for all the non-drawing things that a carpenters pencil gets used for – as a glue spreader, a little wedge or lever, and so on. Anyway, putting practicality aside, the Striker carpenter mechanical pencil certainly looks interesting, and I’m glad to have one. Thanks to Henrik for sending me one. The Striker is of relatively normal dimensions for a carpenter pencil. Tough plastic body with a pocket clip. It is a push top mechanism - that whole black pocket clip section is the ‘push button’ - but it’s not your normal mechanism. Basically it’s a clutch pencil or leadholder with a rudimentary advance mechanism. The pencil has to be held horizontally for the lead to advance. Hold it vertically facing downwards and the lead will free-fall as you push the top, and the lead won’t advance if it's facing upwards. Feast your eyes on those leads! Woo-hoo! The Catepillar of lead! Striker brand them as Dura Lead. As well as “medium density” graphite, there are red and white coloured replacement leads available. 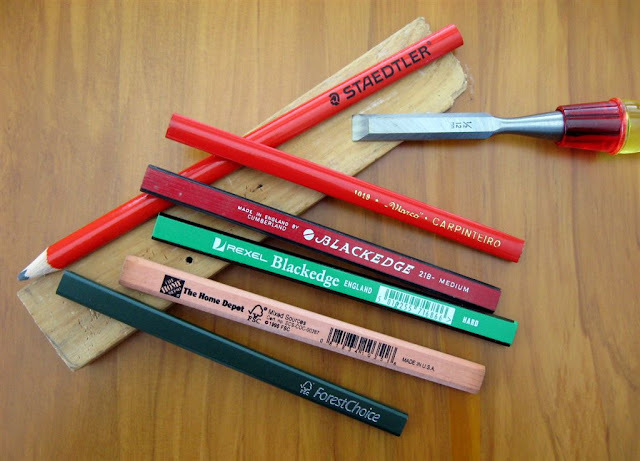 I’m under the impression some artists use carpenter pencils so the Striker maybe useful for them, and I could see it being used in some home workshops, but for carpenters out on the building site…I have my doubts. So, if anyone who swings a hammer for a living (well these days its probably more like pulls the trigger on a nail gun) reads this and has used a Striker then it would be interesting to read your comments. Of course that also goes for anyone who uses a Striker for any other purposes too. From Isu, here’s two mechanical pencils aimed at the Japanese domestic market for carpenter pencils…but that’s a posting for another day. Regular readers will hopefully remember I am putting the Paper Mate Biodegradable Mechanical pencil to the test. Well, 6 months is up, time to dig up ole Papermate Biodegradable and check him out. So, just as a reminder, here we have the gravesite test site. Now then, lets dig down about 30-40mm (1 1/2 inches) to uncover our test subject. First glance doesn't show any changes. Let's have a closer look. Note I have just brushed a little dirt off. I didn't want to wash or clean it for fear that would remove too many micro-greeblies, and set the whole decomposition process back. Well, the surface etc all looks in pretty good condition. The green colour of the top section has lightened, and much of the Paper Mate printing on the barrel has vanished. I guess they are the tastiest bits to the relevant species of microscopic life in my garden soil? Paper Mate® Biodegradable* products have been tested according to internationally recognized standards ISO 17556 and ISO 20200. Tests confirmed that, under normal temperature conditions found in soil/home compost, the product’s biodegradable components biograde (sic) in about a year. Appears to me those micro-greeblies are really going to have to build up a powerful hunger if they are going to eat the rest of that pencil in the next six months. Well, Paper Mate Biodegradable is now buried again, see you in another 6 months. 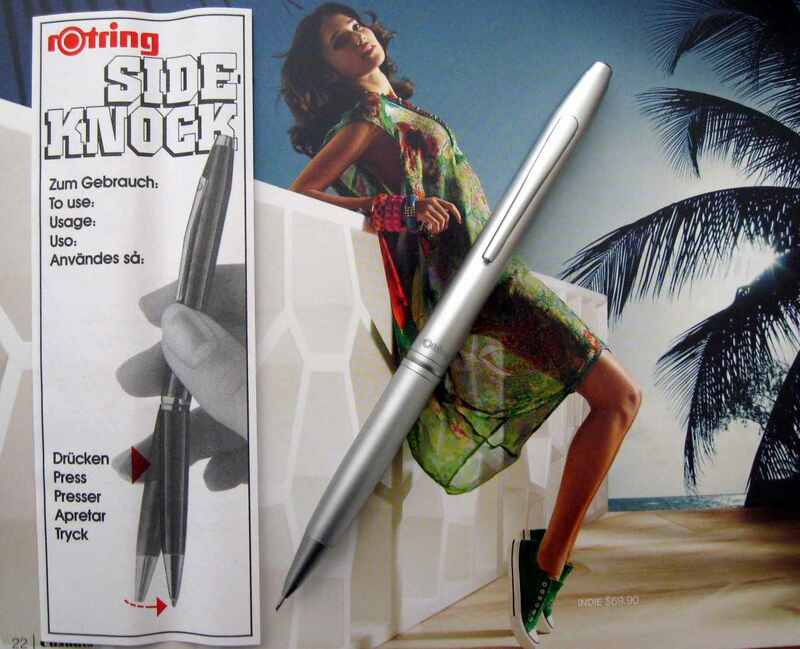 Here’s an unusual one for you, the Rotring Side Knock mechanical pencil. First off, I’m not really sure of its current status. The ballpoint pen in black with chrome trims is available on the Newell Rubbermaid (1) B2B (business to business) website for corporate non-retail customers, i.e. corporate promotional sales. A small number of B2B and retail websites also have the BP and/or MP in polished or matt chrome. Overall though it has a rather scarce presence on the web, and really appears to be part of Rotrings corporate customer offering rather than their retail offering. Second I’m not sure of its relationship to the Rotring 900 Side Knock. I don’t have one of those but it would appear to use the same mechanism so I would guess it’s internally the same, just a different body. Third, it’s a Rotring but it doesn’t have a Rot Ring (Red Ring). [As an aside, how about you German speakers suggest some suitable names for Rotring-less Rotrings.] Some websites do though show the Side Knock with a red ring. Even the Newell Rubbermaid website has images with and without the red ring. I also found it described as the Rotring Side Knock by Parker! Fourth, an indication of country of origin is conspicuously absent. That “side knock” terminology is suspiciously Japanese, so I’d suspect it is another one of the many Japanese manufactured Rotrings. I wonder, do Rotring actually make any mechanical pencils themselves these days? Right then, enough of what I don’t know, let’s get on with the review. On the one hand the Side Knock in matt chrome is a fairly plain looking mechanical pencil. It doesn’t have any trims or other embellishments that stand out. On the other hand it has classical lines and the metallic look is not unattractive, just a bit plain. When you pick the Side Knock up, that metallic look certainly combines with the weight (25 grams) to send a clear message that this is a writing instrument of substance. The Side Knock is a general writing pencil. The matt chrome body is smooth, so the grip is not fantastic, but not too bad for a pencil without any specific grip zone or enhancements. The short lead sleeve is fixed so it’s not pocket safe. There is a small emergency use only eraser – you unscrew the very top section of the body to access it. A bit of a rigmarole quite frankly. The pocket clip is solid and functional. ﻿but I’ve got to admit, I got used to it very quickly and quite liked it. I’m not usually a fan of side-clicker buttons on mechanical pencils. The side button may get in the way of where you want to grip the pencil, you cannot rotate the pencil at will, the button often isn’t particularly pleasing to my eye, etc. The bend in the middle concept of the Side Knock though eliminates all those negatives – you can grip the pencil wherever you like, rotate it at will as the pencil bends in any direction, and there’s no ugly button sticking out the side. You can just write away and when the lead wears down you just press inwards with your thumb to bend the body and ‘Hey presto’, more lead. It’s a very minimal interruption to your writing if you want it to be. Alternatively if it’s time for a little pause and contemplation then the bending action can provide a welcome interlude. If you like side button clickers then you will probably love the Rotring Side Knock. Ahhh, but nothing is perfect. A mechanical pencil that is designed to bend in the middle…well it’s not exactly going to win an award for sturdy rigidity is it. There are times when you can feel the pencil flex, particularly if you grip it fairly high up. Those folk who grip their pencil really tightly might have some extra problems. I personally noticed the flex most often when I just grabbed the pencil off the desk, gripping it fairly high up and intending to just tick a couple of boxes or scribble a couple of numbers down. The flex can be rather disconcerting, particularly to a new user. I should emphasise though that the flex was never enough to inadvertently advance the lead. So, how exactly does bending the body make more lead come out the tip? Well, like I said, the mechanism is a normal everyday one just like in your everyday push top button mechanical pencil. The difference is in the activation. How does it work? 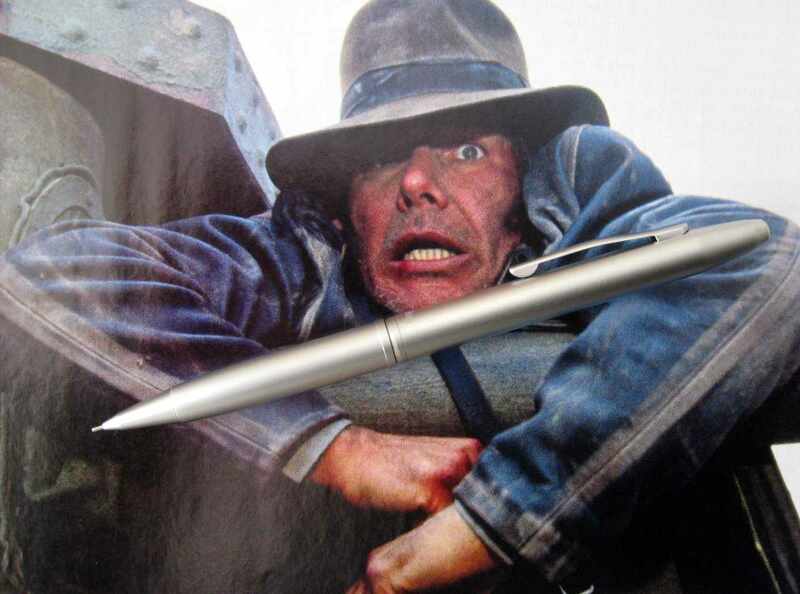 In simple terms, inside the body of the mechanical pencil, the rod that would normally be pushed down by the top button has a cap on it which rests against a curved face. 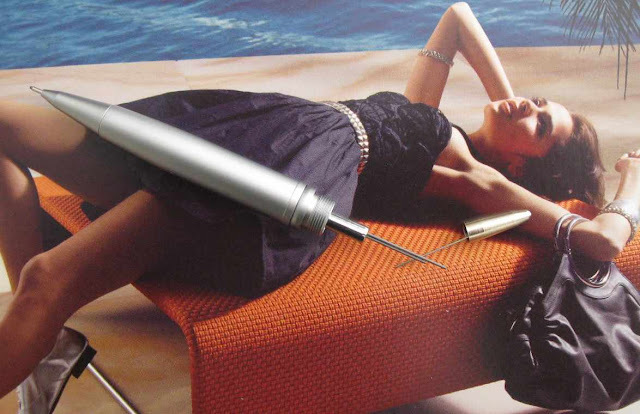 As the pencil body is bent to one side the rod slides against the face and is pushed downwards by the curve thus activating the lead advance mechanism just as if a button had been pushed down on the top of the pencil. One question is how long will the curved face and rod last? Over time will the rod and/or the face wear to such an extent that it affects the action of the pencil. That’s something I can’t tell you after a few weeks use. 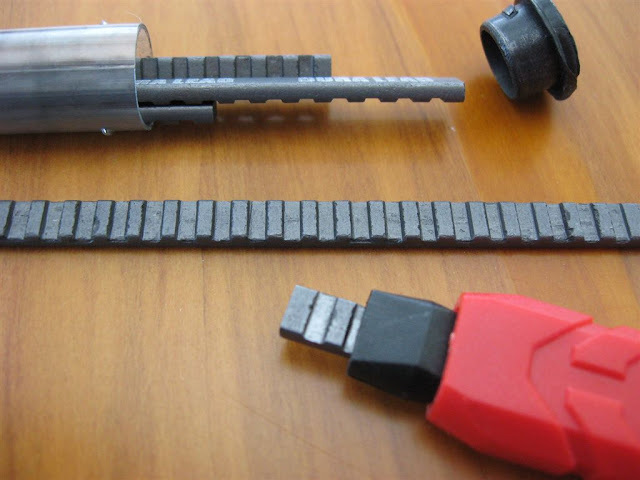 However, a couple of people who have had pencils with this type of mechanism have contacted me over the years and mentioned that there was some wear and/or failure over time, but I think they also felt they got an acceptable lifespan out of the pencil. Ten bends of the pencil will get you 7mm of the 0.5mm lead. To refill the lead chamber you unscrew the top half of the pencil to reveal the push rod. Then you pull that metal cap off the rod. Note the lead clearance needle. The word “Rotring” just above the centre joint is the only marking on the pencil. That’s a little disappointing. If ever a pencil could do with a name or model number on it, this it. In summary then, I didn’t really expect to like this mechanical pencil all that much, but it really surprised me. It is a worthy addition to any collection of writing instruments, and if you have read this far you should go shopping now. • Best Points – it gets a lot of points for the unusual mechanism. • Not So Good Points – a touch of colour wouldn’t hurt…like for instance a red ring. Non-retractable lead sleeve. • Does this pencil make it into the Top 5? – Hmmmm…difficult. This is a very interesting pencil. OK, I need to go back to the beginning. The main criteria for the Top 5 is, “If I was starting from scratch and could only buy five pencils, would it be one of them?” So, let’s compare it to the existing Top 5. Sharp Kerry is safe, Scribble is safe, Tasche is…not, 925 25 is safe, Accugraph is…not. The buildings on fire, Tasche, Accugraph and Side Knock are on the desk…only got time to grab two…which one gets left behind? Arrrrgghhh, an agonising choice…but…sorry Tasche. So, Ohto Tasche is removed from the Top 5 and replaced by Rotring Side Knock. Dimensions – Length 135mm, diameter 9mm. Balance point about 60mm up from the tip. I feel like I’ve gone from a famine to a feast. Normally guest articles are few and far between on this blog, but over the past few months I’ve had a whole bunch of guest submissions. All that arm twisting has paid off, and there’s even been some volunteers too! Now, here’s a guest review from Derek, aka ThirdeYe, who recently started his own writing instrument blog, as you’ll see below. The first things I noticed about the “new” Pentel Champ were its color and interesting grip. This is one of Pentel’s more modern releases, consequently made in China like some of Pentel’s other newer releases like the Client and the Jolt. While I find this trend disturbing, I don’t have any real issues with the Jolt or the Client. I am not sure exactly when they changed, but both the Pentel Champ and the Pentel Icy used to have a smaller grip that did not interfere with the way you held the pencil. Pentel decided to shake things up a bit by introducing a new grip on both of the pencils while still offering the old version on their website. However, this is the “new” Champ that I am reviewing. Let’s start with the vitals. The Champ comes with 2 60mm HB sticks of lead. It is offered in both 0.5mm (AL15) and 0.7mm (AL17), but I tested only the 0.7mm. The MSRP for these pencils, according to Pentel, is $1.05/each for both the new and old style Champ. It comes in a variety of bright colors, such as blue, orange, light green, red, pink, purple, etc. It utilizes a fixed plastic sleeve, with no metal support like those found in drafting pencils. 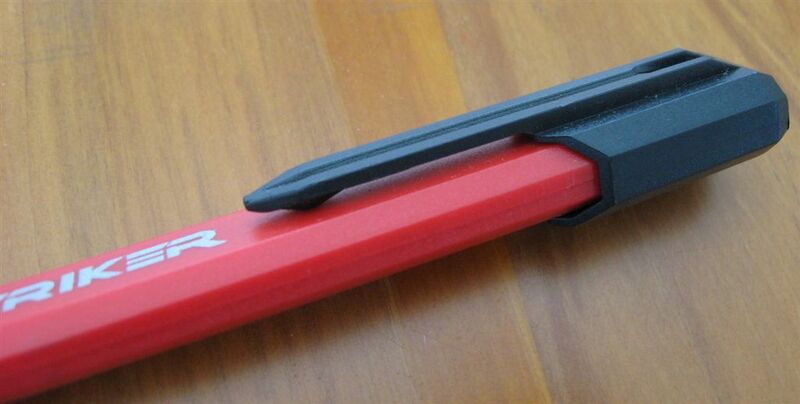 It has a 1” conformed grip and it uses a standard Pentel PDE-1 universal eraser. At first glance, the grip looks soft, ergonomic and comfortable. In practice however, all it seems to do is collect dirt/ink and get in the way. I hold my writing instruments differently than most, only using my index finger tip, the underside of my thumb, and the side of my middle finger. Most people tend to do a 2 or 3 fingertip grip, while I use one tip for control/precision and the sides of my fingers for sturdiness. With this pencil, it leads to an awkward and uncomfortable writing experience. When you compare it to other pencils like the EnerGize, TranXition, and Paper Mate Mega Lead (which have better grips), the grip on the Champ forces you to hold the pencil higher up the barrel which to me at least, reduces the overall control and precision of my writing. I know that in Dave’s review of the Pentel Client, he enjoyed the contoured grip, so I know my opinion may be going against the grain. Another point I’d like to mention is the overall cheap construction of the pencil. On the green Champ I own, the grip appears to be distorted or installed incorrectly, causing it to look “pinched” in an area. The pencil feels flimsy and the top removable green insert that holds the eraser feels like it could break easily. When you use the clip on a stack of more than 10 papers, it actually causes the entire green section to start to bend and put pressure on the inner lead-retaining tube. Back to the grip collecting debris… the material reminds me of Silly Putty, with its bright color, squishy consistency and also its tendency to transfer ink & other materials when pressed against a newspaper, etc. When testing my fleet of Champs for this review, I would occasionally glance at the grip only to notice it was covered in black debris that could be wiped off with some effort. Fast forward a few days to when I was using one to do some crossword puzzles and I realized this is not a good crossword pencil. When I do crosswords, I occasionally take a break by using my pencil/pen as a temporary bookmark like I imagine others do. Normally this isn’t an issue for me, but rather a convenience. The Champ however, even without any applied pressure, transferred the ink from the two pages it was sandwiched between much like silly putty to the grip. You could actually read the letters on the grip! This is definitely a nuisance to someone like me who tries his best to keep my pens/pencils in like-new condition. After physically writing out the latter paragraph in my hand-written draft of this review, my hand and wrist started to hurt and fatigue too much to continue. In college, I would use Bic Matic pencils almost exclusively and never had this happen this severe, even during extended periods of writing. I had to take a break and rest my hand before I wrapped up the review in my next paragraph. I have a Pentel Icy with the old grip that the Champ used to share with it, and I much prefer that to this new Grip that they put on the Champ and Icy. As readers of my blog could attest to, I am a big fan of Pentel products and I really wanted to “crown” the Champ. Don’t get me wrong, it may be a decent pencil to those that hold their pencil in a way to utilize the grip more properly, but it was ruined to me by the poor ergonomics, its seemingly cheap construction, and the grip’s “Silly Putty”-esque features. I would pass on these pencils and opt for one of Pentel’s better offerings. Pentel is known for making high-quality, yet affordable, mechanical pencils. In my opinion, the Champ does not do Pentel justice. For only $2 more or so, it’s a no-brainer to opt for the much better Sharplet-2 or try to find the Champ/Icy with its old-style grip that is still being sold on Pentel’s online store. Thanks Derek. I can certainly see that silly putty business being annoying. Keep up the blogging. Dave. Following on from Monteverde Grafica, here’s my other 5.6mm leadholder. I really don’t know why I bought it, but I picked it up for a couple of bucks in a Dollar Store. The tip and jaws are metal, the body is plastic with an almost rubberised sort of feel to it. Round grip section and octagonal main body. There is a rotatable lead hardness indicator, with selections 2B, 4B, 6B and 8B. I note that the packaging also implies HB lead is available, even though there's no such option on the hardness indicator. There is no lead sharpener under the top cap, which isn’t intended to come off. The brand is Marie’s, and according to the packaging that would be Shanghai SIIC Marie Painting Materials Co. Ltd.
For the price, this actually seems a pretty good buy to me. After Vikrams leadholder articles, I thought I’d better just join in and show I’m not completely leadholder or clutch pencil-less. True, I don’t have many, but here’s the latest one I acquired. It tends to stand out from the crowd. The Monteverde Grafica 5.6mm Pencil / Leadholder in the stained glass colourway. Other colour options, and ink options, are also available…well that should really be past tense as the Grafica is a ‘retried collection’ and no longer manufactured. Just FYI, Monteverde is a brand of Yafa Inc. of the USA. ﻿The stained glass effect is embedded without borders, unlike stained glass lead light windows. You do have some colour options in 5.6mm leads. The pocket clip has a rollerball on its end. It works well, pretty FAB. Multi-toothed jaws. Push the top cap to open the jaws. There is a sharpener under the top cap. 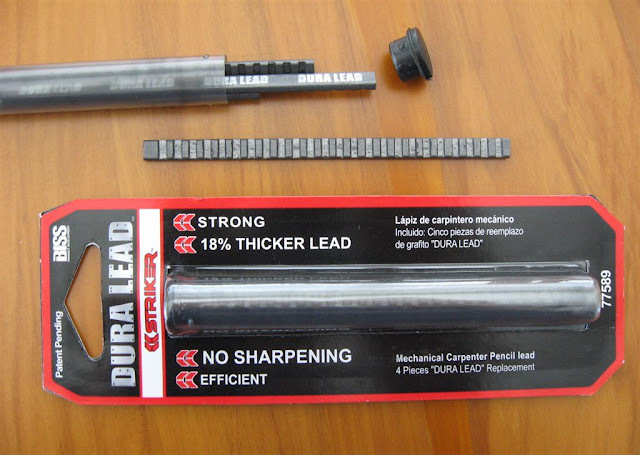 I can imagine 5.6mm leadholders being suitable for some sketch artists and making rough layout drawings, etc. At the end of the day though, for me personally...5.6mm... the answer is yes.